Toward Japan’s rebuilding, it is imperative that we undertake a critical review of the country’s so-called “Lost Decade(s).” What specifically did Japan lose? How and why did Japan’s policies fail? What was the alternative? In light of the further economic and political meltdowns likely to cloud Japan’s prospects in the coming years, such questions must be addressed head-on. Getting to the bottom of these questions goes beyond national concerns; it goes beyond rebuilding Japan. Given Japan’s key role in the regional order, Japan’s precipitous decline would gravely destabilize the Asia-Pacific and, more broadly, the world. It is crucial to shed light on this linkage. In this sense, we reviewed past few decades from an international perspective rather than from a myopically Japan-centric one. The research took the format of a case study in 15 discourses. International research team collected the oral history, which the section authors then harness to compose the report. The team consists of both Japanese and international authors and researchers. Why has Japan still not been able to recover after the collapse of the bubble economy? This is the key puzzle that this project seeks to answer. 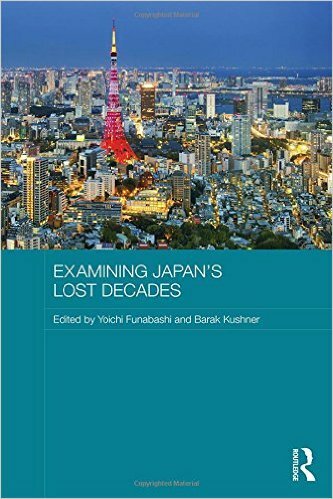 A team of leading Japanese and international experts were assembled to examine Japan’s “Lost Decades” from multiple perspectives, such as: Japan’s public finance, international relations, demographics, labor structure, women’s life patterns, intergenerational fairness, business and technological innovation, etc. Japan’s experience has global relevance and there are lessons to be learned from Japan’s “lost 20 years.” Developed countries across the world are facing the same economic and social challenges that have plagued Japan. Accordingly, Japan can serve as a model for future policy initiatives that will contribute to providing solutions to shared global challenges in the 21st century. The International Conference for the Lost Decades project was carried out May 10th – 12th. The aim of the international conference is for the author and researchers to gather in Tokyo and hold discussions on the contents and linkage of each chapter besides the conceptual question of “what is the lost decades?”. Since the project was launched in January, the Japanese authors and researchers had held meetings on a regular basis and contact with the authors overseas were carried out through teleconference but this is an important milestone in the process of the project and to deepen the understanding between each theme and chapter to push forward on the research. The authors and researchers came to a conclusion on the image of the final output of the project in order to carry out actual interviews and surveys. Member of the Monetary Policy Committee of the Bank of England, 2009-2012. Member of the Panel of Economic Advisers to the US Congressional Budget Office, 2007-present. His research and policy expertise focuses on macroeconomic policy, European and Japanese political economy, central banking issues, and the resolution of financial crises. He Joined the MITI in 1991 and was Fellow at RIETI from 2001. Extensive experience in macroeconomics research in areas such as endogenous growth theory, business cycles theory, financial crisis, and bad debt problem. He served as Director of the Edwin O. Reischauer Institute of Japanese Studies from 1998-2004 and 2011-2012. He teaches courses on modern Japanese history with a primary research interest in labor, class and the social and political history of modern Japan. He is currently working with colleagues in Japan and the United States to create a digital archive of Japan’s March 2011 disasters. Chairman of the Independent Investigation Commission on Nuclear Accident of Tokyo Electric Daiichi Nuclear Power Station founded by Japan Rebuild Initiative Foundation. His current research and writing is focused on Asian regional architecture, Japanese politics, U.S. foreign policy history, the Korean peninsula, Tibet, Burma, and U.S.-India relations. He is widely recognized as the leading intellectual architect of APEC. He is recipient of the Asia Pacific Prize, the Weary Dunlop Award, the Japanese Order of the Rising Sun with Gold Rays and Neck Ribbon, the Australian Centenary Medal and he is a member of the Order of Australia. Expertise in Japanese domestic politics and foreign policy; Northeast Asia regional security; and international relations of the Asia Pacific. His research field is international politics, international security. Law and Institution Studies Group, Inter-disciplinary Studies Center. His research field is Indonesia and Thai politics, Urban Politics in Southeast Asia, Overseas Chinese in Southeast Asia. He earned his Ph.D. in Area Studies from Kyoto University in 2006. He also teaches finance and macroeconomics in the Department of Economics and at Hitotsubashi’s Graduate School of International Corporate Strategy. He held the position of Principal Economist at the Institute of Policy Research, Ministry of Finance, Japan from April 2009 to March 2011. He earned his Ph.D. in economics from Harvard University in 1997. Specializes in modern Japanese history, especially regional history and historical remembrance of the Showa era. Research interest: comparative institutional study of party organizations, decentralization, local politics, and institutional reform. Former correspondent for the Financial Times of London (2000-2003); PhD, Faculty of Asian and Middle Eastern Studies, Cambridge UK (2009); Guest researcher at Osaka City University (2010). Swedish citizen. His specialty is Japanese political history research after the World War II. In particular, it is research of the prime minister system and bureaucracy. There is “The origin of the political system of post war Japan : Shigeru Yoshida’s prime minister-led initiative” (Fujiwara Shoten, 2008) as a work. He covers economics and business with a particular focus on the economic security and global issues. He organized the major annual energy-climate conference in Japan, The Asahi Environmental Forum for three years after reporting the critical years in Washington DC as a chief US economic correspondent between 1999-1996. Prior to that, he directed reporting as a news desk editor and the section head of the Japanese business sector news gathering in Tokyo. Nishizaki was the first bureau chief in the Silicon Valley, US, after actively having reported the US finance and business as a New York bureau correspondent since 1998. Before then, he covered the Japanese Ministries of Finance, Trade and Industry and Foreign Affairs while also reporting widely the electronics and machinery, infrastructure and service industries in Japan. He is a contributing editor of Foreign Policy (Washington, DC). In 1985 he received the Vaughn-Ueda Prize for his reporting on international affairs. He won the Japan Press Award, known as Japan’s “Pulitzer Prize”, in 1994 for his columns on foreign policy, and his articles in Foreign Affairs and Foreign Policy won the Ishibashi Tanzan Prize in 1992. He is the author of several prizewinning books; Alliance Adrift (Council on Foreign Relations Press, 1998, winner of the Shincho Arts and Sciences Award); Asia-Pacific Fusion: Japan’s Role in APEC (Institute for International Economics, 1995, winner of the Mainichi Shimbun Asia Pacific Grand Prix Award) and others.